The pets trapped on the post-Irma, pre-Maria, hurricane-rocked U.S. Virgin Islands were flown to the safety of the mainland Monday. 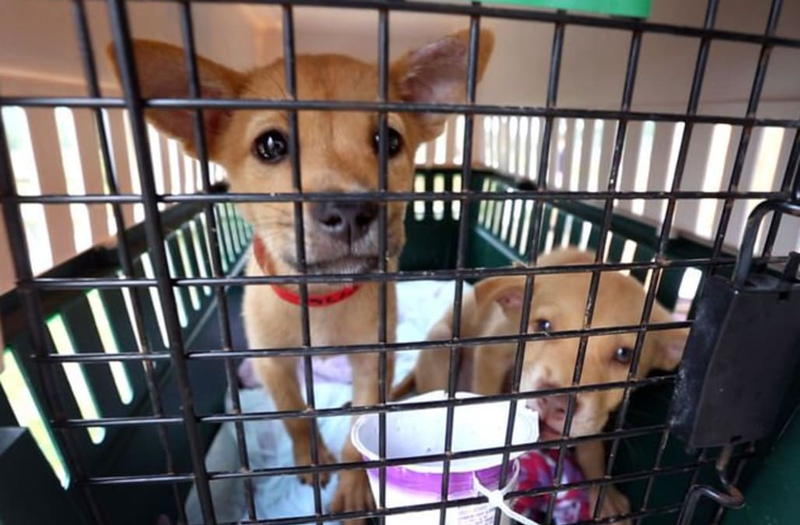 Pets from all three of the U.S. Virgin Islands - St. Thomas, St. John and St. Croix - were rescued after Hurricane Irma tore through the region but before Maria made landfall by Virginia Beach's Island Dog Rescue co-founder, Sali Gear. Gear grew up on the Caribbean islands and planned to fly 20 animals to the States each day for a week after Irma hit but decided to escalate her plan once Maria barreled into the picture. She then chartered a private plane to bring over 300 animals that were either abandoned or offered up by their owners to Norfolk, Va. on Monday. "This is a Herculean effort to save these animals," Gear told Virginia Beach TV news station WAVY 10. "So when I watched Irma build up, I called the shelters ahead of time and said, 'Hey, I'm here for you.'" Boats picked up dogs and cats and brought them to St. Thomas from the other islands in anticipation of the furry friends' flight. Volunteers who responded to her rescue group's Facebook post for help gathered up $112,000 in donations and Gear's own money to pay for the jet, the Virginian Pilot reported. Upon arrival, the pets were taken to Gear's farm, nearby shelters, new families or by other rescue organization. "I did it because it had to be done," Gear told the Virginian Pilot. "People have moved heaven and earth to make this happen." The animals were taken out of a truly disastrous situation on the U.S. Virgin Islands, where Irma killed at least three people and electricity is expected to be out for months. Gear learned that on Wednesday, one of the shelters that she emptied with her rescue mission was destroyed by Hurricane Maria. "The puppy room and cat room are completely gone," Gear said the shelter's manager said.